Part 2: Posted 22/11/2012: Click here for the full sized original post. 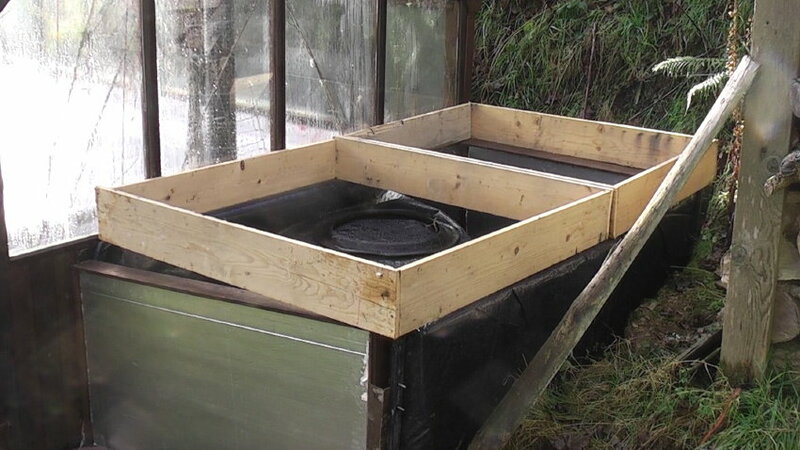 I’ve continued to trawl the internet to find examples of workable designs for a compost heap based system for heating a smallish greenhouse. Much of interest has been gleaned, but little concrete information beyond the many frustratingly inadequate You Tube postings of various trail blazers – usually lacking details or follow up on how well a system has worked. Even more frustrating when our satellite broadband insists on chopping any videos into 5 second bits. 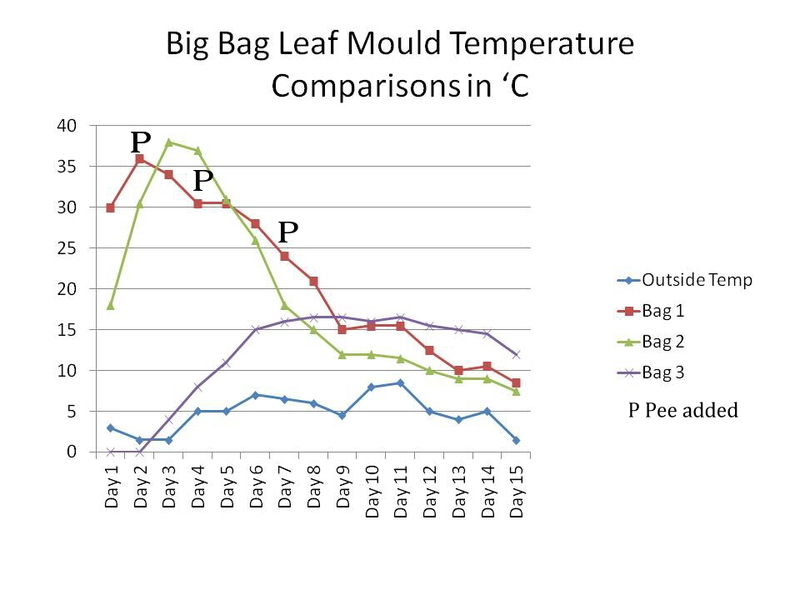 So…… here goes with an old tech blog record of my own attempts …..
My initial research using leaf mould prepared as in my last post gave really useful temperature data which Fiona has very kindly converted into the graph below…. 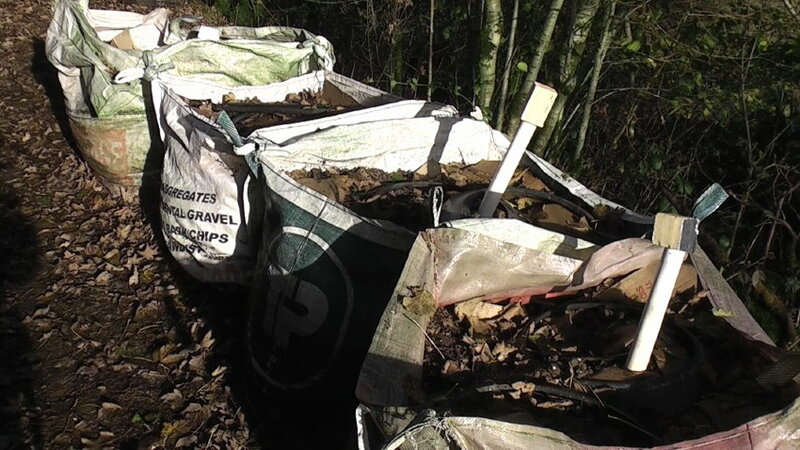 Essentially the 3 Big Bags I monitored were filled with pretty similar chopped leaf material, although the bags were filled at slightly different times. (Big Bag 1 was started 3 days before I decided to check temperatures, and Big Bag 2 the day before the graph starts – the usual problem of poor design with amateur experiments, eh?). Leaf mould is pretty widely accessible and generally nutrient poor, but is still in percentage terms a relatively carbon (C) rich but nitrogen (N) poor starting material. So I opted to use the easiest measurable N source potentially available to all gardeners to try to correct this lack of nitrogen. (The squeamish should skip the next bit). Urine. 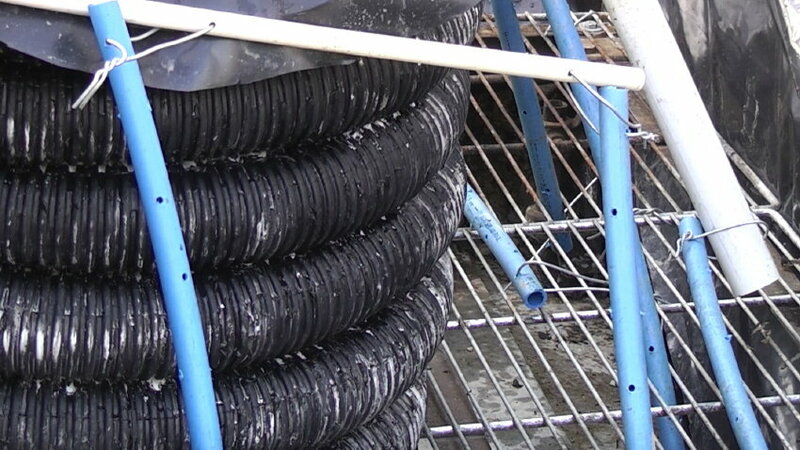 The general consensus from many sources is that for a good composting process a ratio in the raw material mix of about 30:1 (C:N) will give best results. But how on earth do you know what actual mix you have? The best summaries I read on the factors involved, and the relative C:N ratios of various compostable materials, can be found by clicking here, here,here and here. That nitrogen, at least as watered on urine, results in higher temperatures being reached than with ‘untreated’ leaf mould. That repeated applications seem to slightly extend the period of higher temperatures. That with any of these systems, potentially usable heat generation lasts only about 10 days. That by the end of this period, the volume of the leaf mould has settled by about a quarter. Although the form and appearance of the leaf mould has certainly not significantly changed from the starting appearance over this short time. 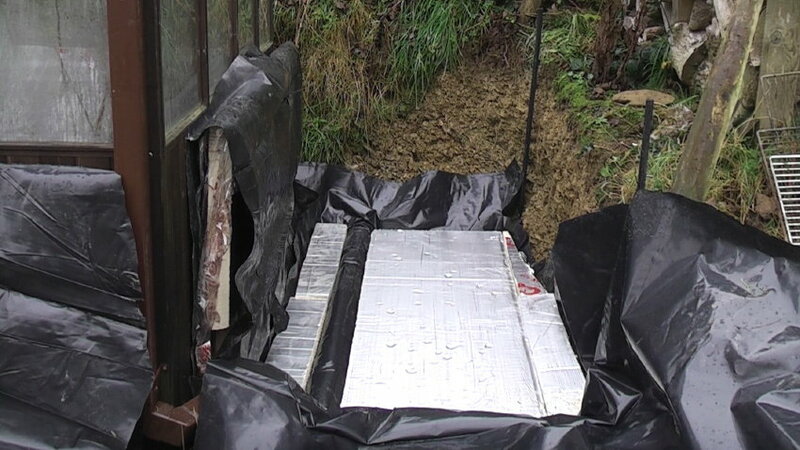 Leaf mould with no supplementary urine will probably retain its heat generation capabilities, albeit at a lower level, for longer than urine treated leaf mould. Allow simple topping up of the heap on a frequent basis to help to try to keep temperatures at a modest, though raised level. 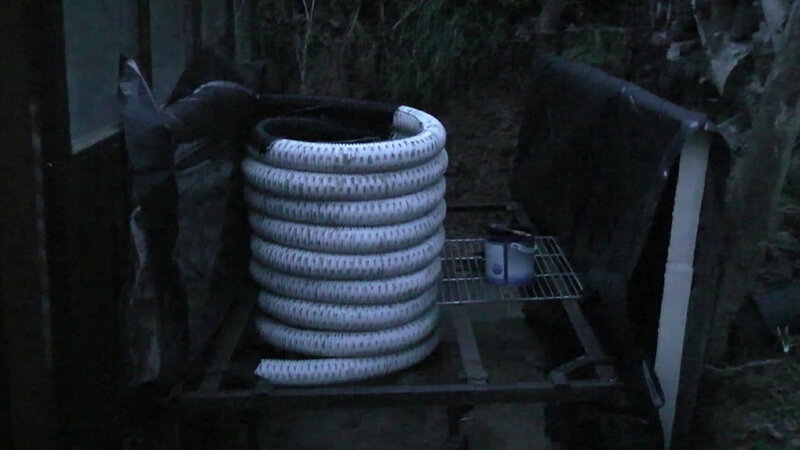 Expect to need to regularly add supplementary nitrogen as urine, and since we now have access to fresh poultry manure, this as well, to aid heat generation over the winter months. Fresh green material such as grass clippings, which are the other N rich compostable material normally widely available to many gardeners, are obviously less abundant at this time. 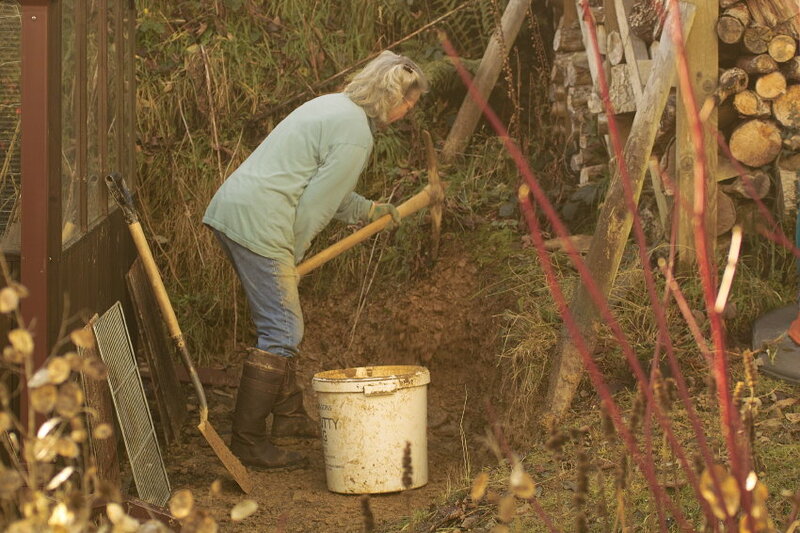 Ideally raise the heap to allow finished compost to fall from, or be raked out from, the heap’s base, and so allow the heap to be managed for several winter months without having to be completely dug out, and started again from scratch. 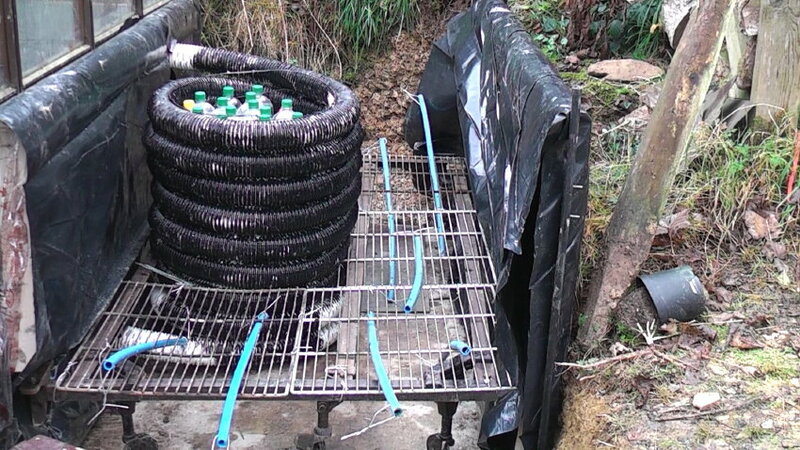 The long list of photos below is designed to illustrate how the eventual compost bed was constructed. As with most things we do, no formal plans were drawn up. (And it shows, I hear you sigh….). If at any point anyone reading this would like further clarification of what we’ve done here, do feel free to add a question through the comments below and I’ll try to answer. 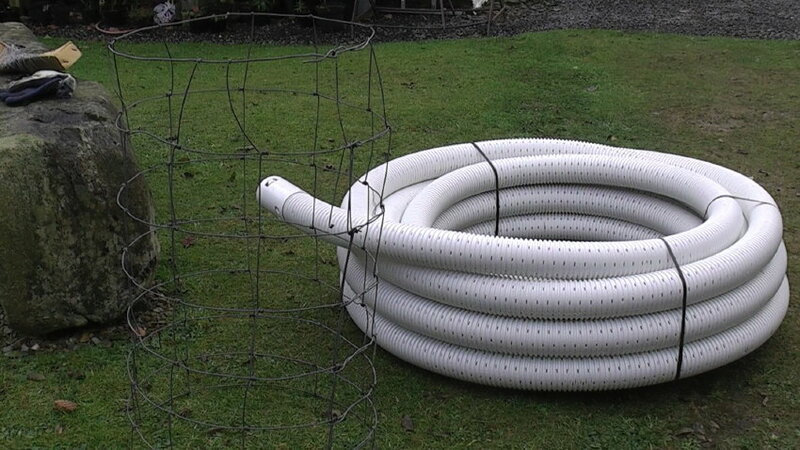 The only item bought in specifically for this construction was this 25 metre roll of 80 mm perforated land drain, of which about 19 metres has been used inside and outside the greenhouse. I probably could have sourced un-perforated pipe. And indeed I shouldhave done so. 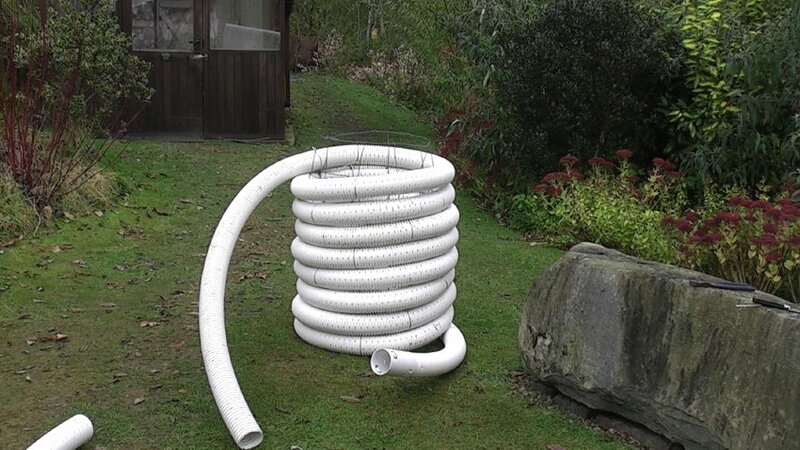 But I needed a few metres of land drain for another project, and reckoned that with some surplus cartons of Gripifill filler/bond from an internal insulation job, I could easily fill all the holes ………. someone else can work out how many holes that was for about 17 metres of used and hole filled pipe, with roughly 8 holes per linear cm…… False economy, and probably an inadequate seal of the whole pipe…which may be a fatal flaw with the system. Advice note number 1 – Buy un-perforated pipe! 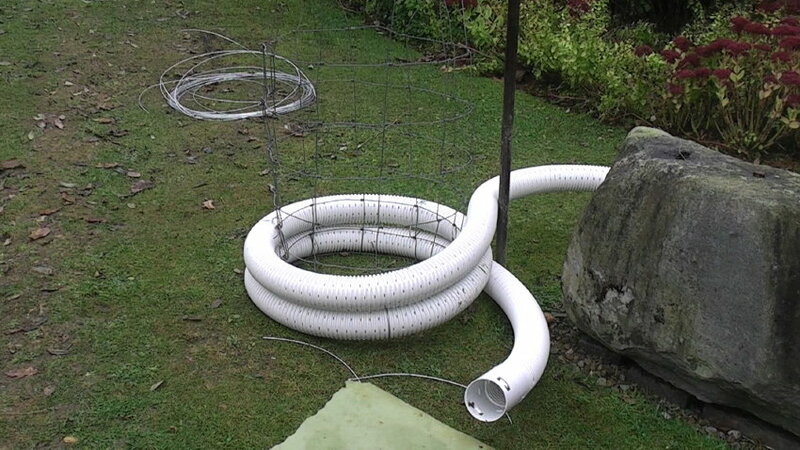 The plan was to wrap the pipe around a form made from old sheep netting, in a tight spiral, tying it in with wire, and eventually filling the central space with recycled water filled 2 litre water/pop bottles. 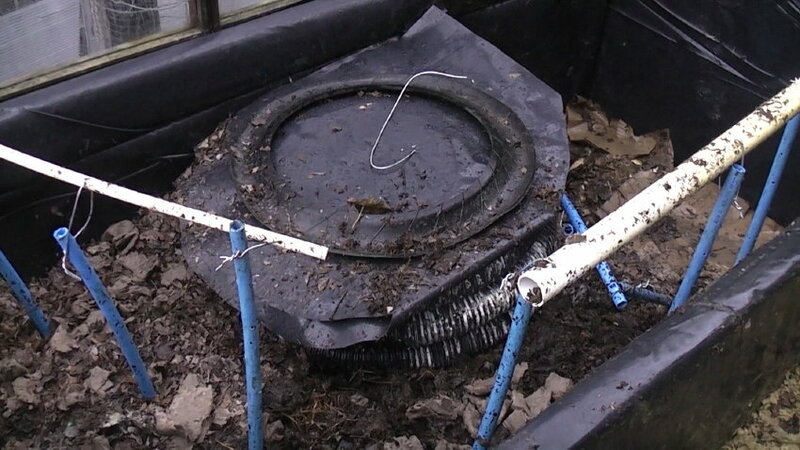 The whole of this ‘Reactor’ would then be placed in the centre of the compost heap and the 2 pipe ends passed through holes cut in the greenhouse gable end. 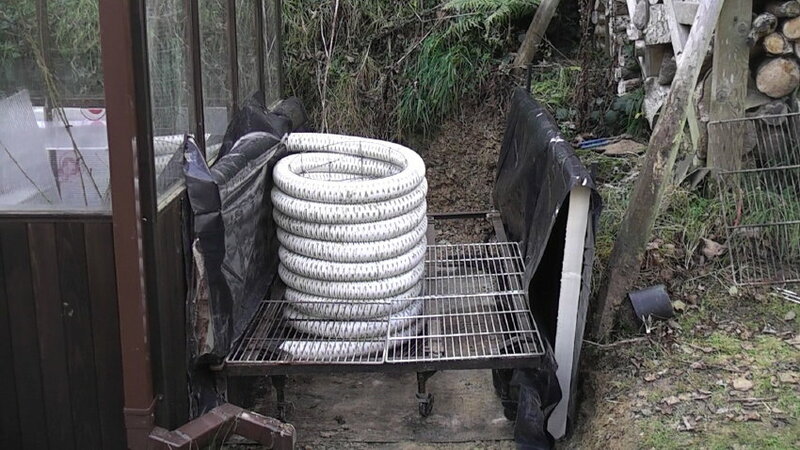 A fan would then be located in the greenhouse to draw air (hopefully heated by the compost) from the top of the spiral, with the lower spiral pipe sucking air from the greenhouse, to pass up through the reactor coil. 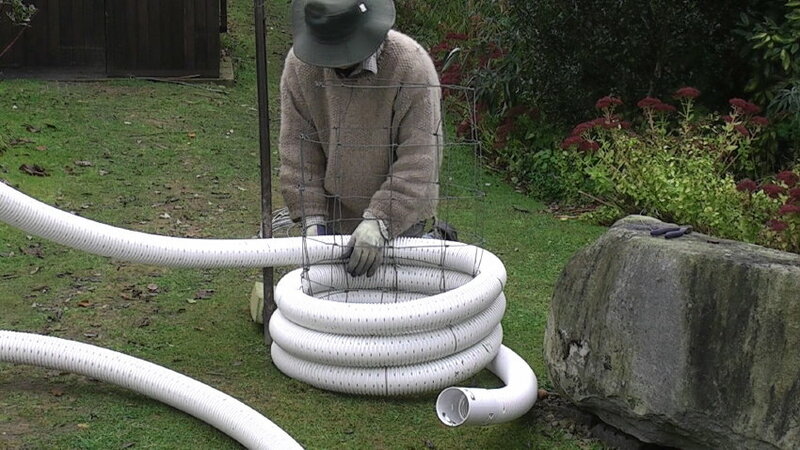 This drainage pipe has a fairly thin corrugated wall – in theory good for heat transfer, but has a mind of its own, so allow a big space, peg the sheep netting form to the ground before starting, use strong wire to tie it in ( 3 ties per layer), a digging bar or extra pair of hands to hold the spiral fairly tight, and allow a bit of extra pipe for feeding through the greenhouse wall, and general odging into place. 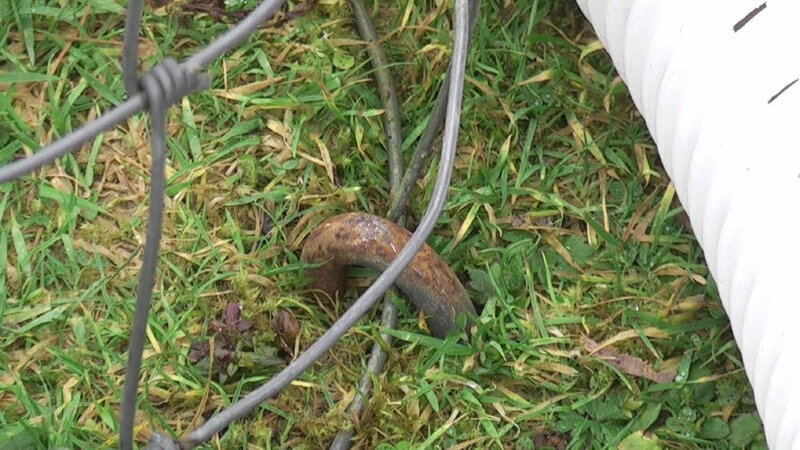 ….In the end, the spiral was upended for use, thus lifting it off the ground by a few inches…. and with a bit of angle grinding I had a raised base to take the 5 grids we’d salvaged from a commercial fridge we’d once owned when we toyed with ‘Dine At Home’ (This was a previous ‘Good Idea’ I’d had to keep Fiona out of mischief, years ago in Bristol. An upmarket freshly cooked 3 course meal from a seasonal changing menu, with wine , if required. Huge fun setting it up. A ridiculous amount of work trying to run it alongside a veterinary practice, and finally seen off by Black Wednesday in the early 1990′s, and the supermarkets starting to roll out exactly this sort of classy prepared food). So nearly 20 years later these grids had also found a niche use. And so this really is a Compost BED to heat a Greenhouse. 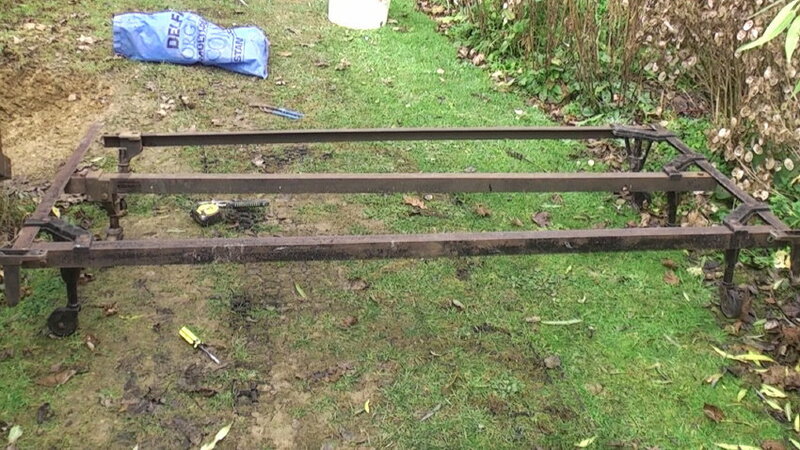 The metal sheets laid beneath the bed which will hopefully ease raking out fallen compost were inherited with our Bristol house bought in 1987, and haven’t really found a good use until now. … advice note 2. Buy black pipe. It beats trying to paint it as dark and dew fell, with inappropriate, but to hand, black paint. The thought being that black walls would aid heat transfer to the circulating air. Ah well…..
After reading an interesting undergraduate thesis on the general concept of heating greenhouses with compost by Courtney Gilson from the University of Waterloo in Canada (click here for link), I started to think a lot more about the need to insulate the heap to maximise any available heat generated, and avoid its loss to the wider world. I want it available to heat the greenhouse if necessary. 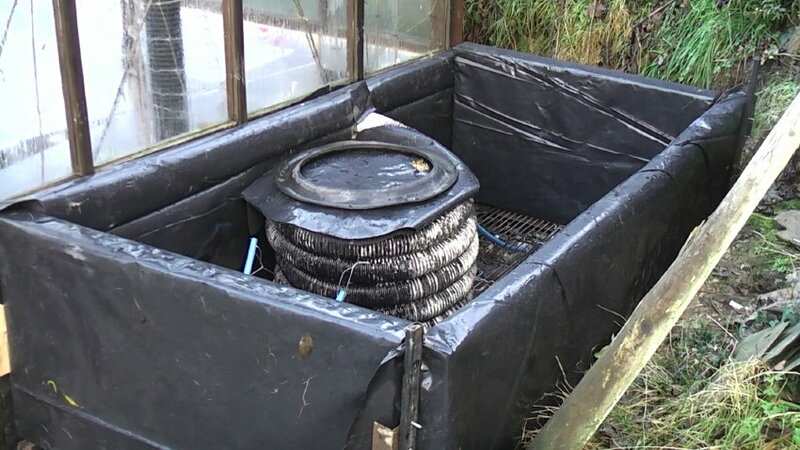 The thesis explains how a compost heap with a footprint of about 16% of the greenhouse footprint should be adequate to heat the structure. Designing my heap before I read any of this to fit the available space between the greenhouse and woodstore, I noticed that my heap of about 1 metre x 1.5 metre x 1 metre compared with an inner greenhouse zone to be heated of about 3 metre x 2 metre x 1 metre is well within this stated capacity calculation. Which cheered me up. For now. 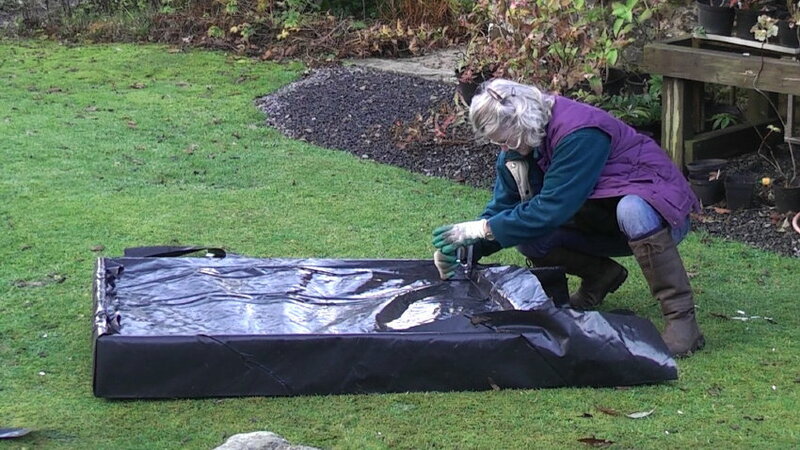 To incorporate insulation all of the sides, top and base were made using left over black DPC thickness plastic sheet, and surplus 70 mm thickness Celotex sheeting – I’d miscalculated a little when adding a second skin to our open to the roof living room! Some of the panels have simple wooden frames made from old timber floorboards. 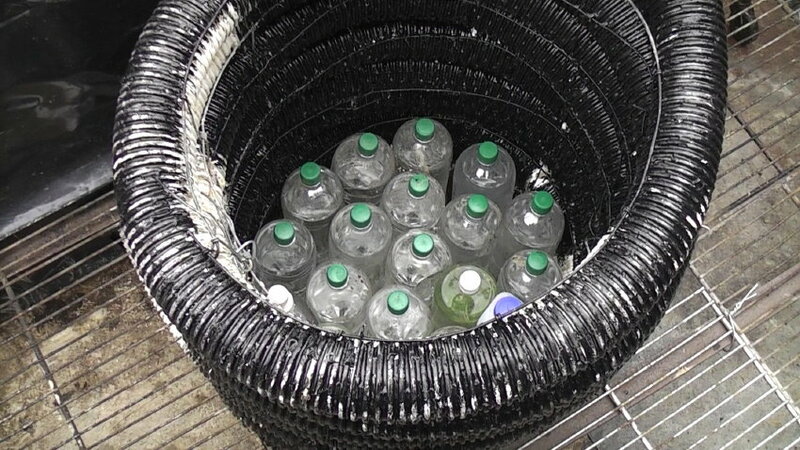 The 2 litre plastic pop/water bottles are chosen to act as an additional means of holding heat as a thermal store inside the reactor core, to help to smooth out any temperature fluctuations when the fan is switched on…. So after about 10 days of working on the construction when it wasn’t raining it was completed. 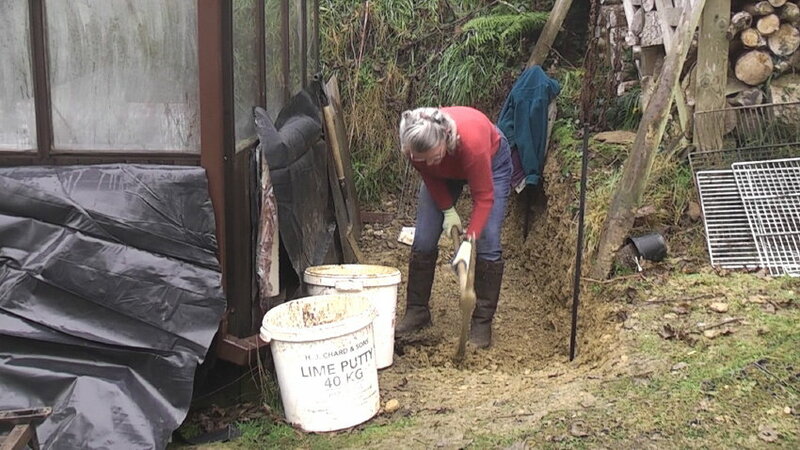 It would have been impossible without a lot of help from Fiona in initially levelling the site…..
…. Prising a pickaxe from her is tricky these days…. 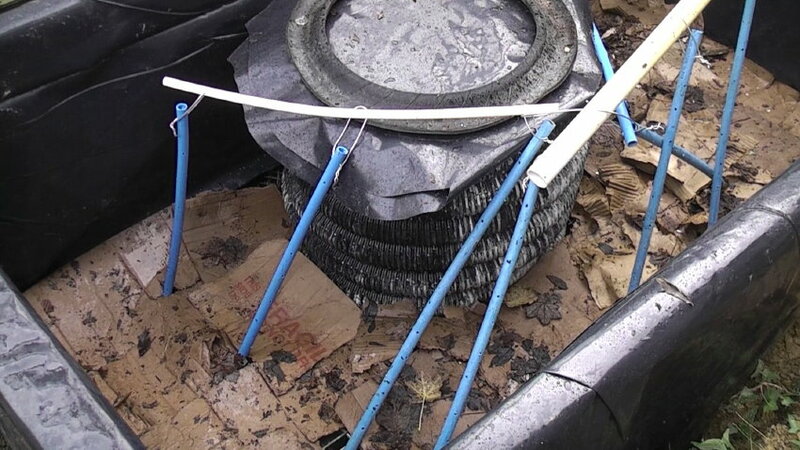 And then coping with me deciding to dig out the base even deeper, half way through the project, to allow insulation to be added at the base as well…..
….And finally agreeing to cut and fix the plastic to the end and top frames. Guess who wraps all our Christmas presents?? 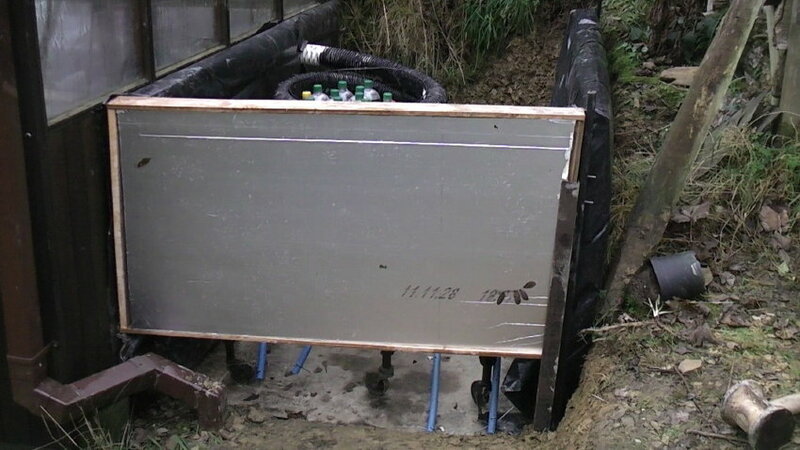 This is one of the top panels, where I opted to use 2 layers (140 mm of Celotex insulation), hence the extra depth. The panels are a little awkward to lift because of dimensions, rather than weight, so I later added a couple of wire strap handles to make lifting them on and off easier. 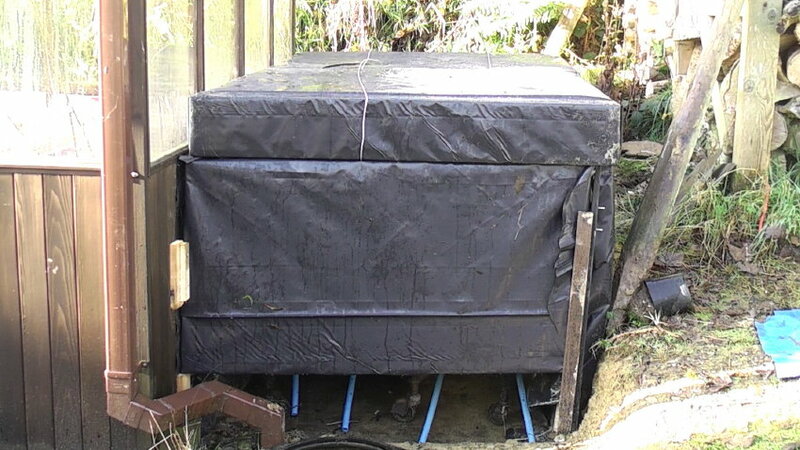 So I’d now got to a point, where I needed to fill up the bed…..
And after laying the wet cardboard sheets from the top of the Big Bags as a base over the grids…..
…… I used as source material most of the 3 Big Bags of leaf mould from the above trial which had obviously already started their composting process (clearly not optimum material, but I figured there was still a lot of decaying to take place), alternating with material from a couple of Big Bags which had poultry house waste – droppings and paper/hay, alternating with layers of leaves or wood waste. A couple of hours shovelling and carrying tubs of material before the fading light called a halt nearly finished the job …and me…. But the following day, in spite of a howling gale I couldn’t resist lifting the lid for a temperature reading. Only 2.5 degrees C.
…. this is an earlier photo… lower panels are now added as well…. Oh dear. Patience was clearly going to be required. Gloom settled with the lowering clouds…. And I suspect that whilst a silly amount of hard work has gone into this, (and others may judge an equally bizarre or extravagant use of materials has got me to here), the real challenge of understanding how to operate this system if it works at all, and its limitations, will play out over a much longer time frame. And whether down the road more exotic Welsh fruit can be grown to rival the Welsh nectarines we enjoyed this summer. (Click here) . 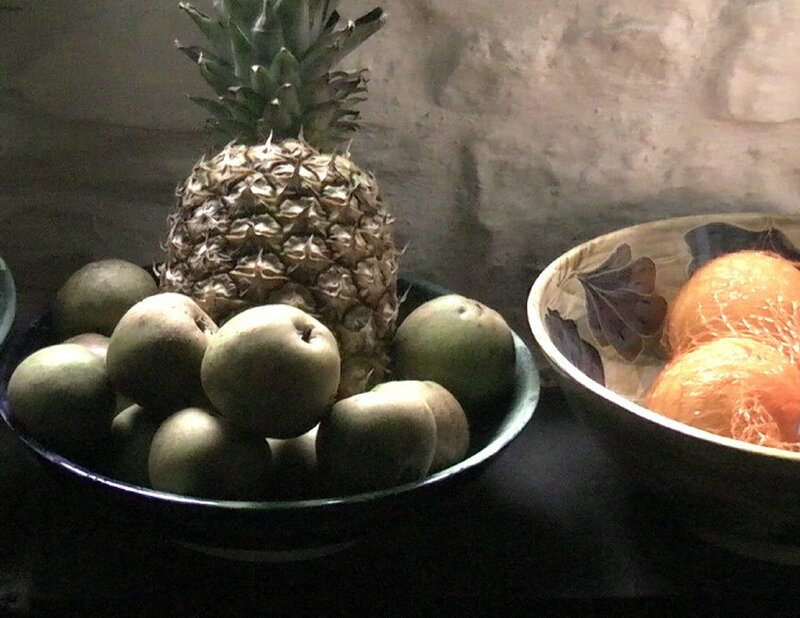 … Welsh apples, Costa Rican Pineapple…Spanish Oranges…. I’ll of course add an interim progress report next time.